As a child, I loved snow days. I would wake up, tiptoe quietly to my window, peek through the slats of the blinds, feel the cold through the window panes, and rejoice when I saw the ground covered with white because that usually meant school was cancelled. As an adult, seeing the ground covered in white does not give me the same feeling of excitement. Thank you to FrostGuard® for sponsoring this message. Instead, I’m filled with dread. While I am thankful that winter snow in Colorado is much different than the ice snow we would get in North Carolina, people still drive in snow in Colorado. There can be three inches of snow and there is still school. Last year, I think the kids had one snow day. ONE. That was it. They went to school in the snow the other days. Last winter, we lived in a rental with a garage. It was awesome! I didn’t have to worry about scraping snow or frost off the car, adding 20 unexpected minutes to the time it would take before we had to leave. This year though, we moved into an apartment without a garage to park our car in. Have you ever tried to gather hats, coats, boots, gloves, scarves, and backpacks to put on children before school? Herding cats would be an understatement. Even if I hand everyone their gloves and jackets, by the time we put on boots, the gloves have been misplaced and the hats are not where they were left. We have specific places for winter gear and it doesn’t matter, things still walk off and get put in different places. Add that to the amount of time it takes to scrape winter off the car and we’re already late. 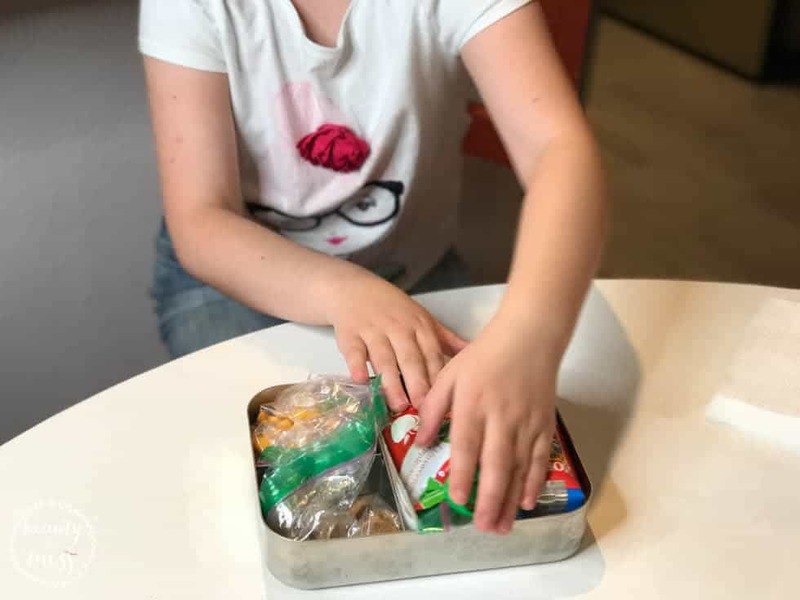 I’ve learned a few tips and tricks though that will help you get out the door on time without losing your mind on a snow day, even if you have little kids. 1. I mentioned it before but I’ll highlight it this time because it can be filed under snow day tips. Have a specific place for your winter gear so you aren’t searching high and low for the missing glove or boot. It’s all right there in one place. It is an amazing feeling to not have to run frantically through the house trying to find matches. I even keep their gloves and hats in their backpacks so if it happens to snow during the school day, they are prepared. 2. Pack lunches and snacks the night before. While during sunny days this doesn’t seem like it takes a long time, it takes more time than you think it does. Pack it all the night before and you’ll have one less thing to worry about in the morning. 3. Pick out clothes the night before. Clothes can be a huge stressor for kids. Take the stress out of the equation and put the whole outfit together the night before, right down to socks, underwear, and what shoes will be worn. 4. 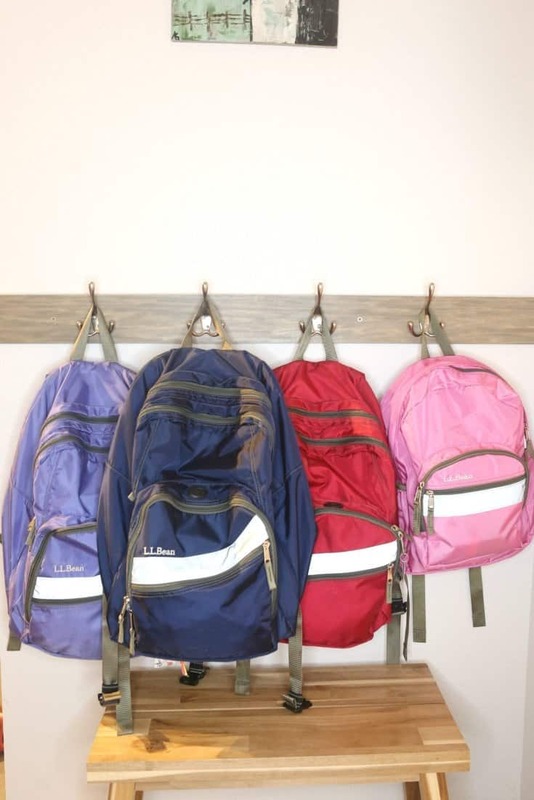 Make sure backpacks loaded with everything they will need for the next day the night before. For us, that includes a signed planner for our oldest, homework folders with completed homework, papers that were brought home and signed, and library books that need to be returned before others can be checked out. 5. When you know there will be frost or snow on your car when you walk outside in the morning, use a FrostGuard® the night before. You’ve spent 20 minutes making sure everyone has eaten breakfast, 15 minutes making sure everyone has shoes and is putting them on. 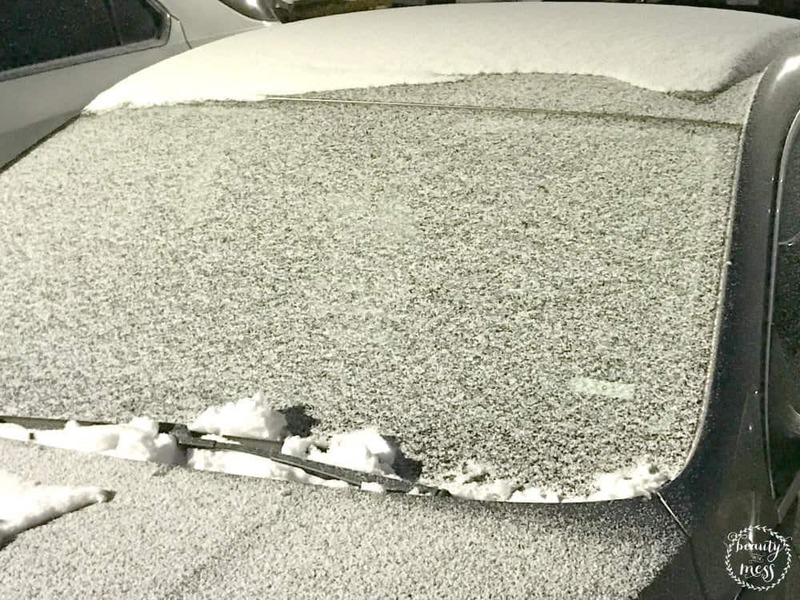 The last thing you have time for is to usher everyone into the car and then spend 20 minutes scraping off the windshield so you can see clearly to be able to drive. Seriously, the FrostGuard cover is amazing. 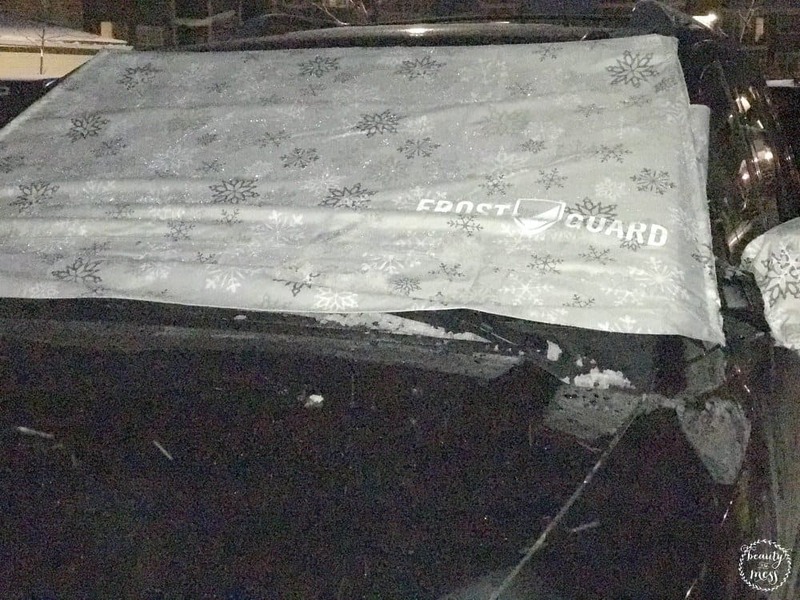 FrostGuard covers are made of heavy-weight polyester with weather-resistant PVC lining that helps keep the frost and snow from sticking to your windshield. It’s super easy to put on the car and take off because of their Fit-Fast® attachment system. It comes in multiple colors, prints, and patterns to fit your taste and works with cars, truck, and SUVs! 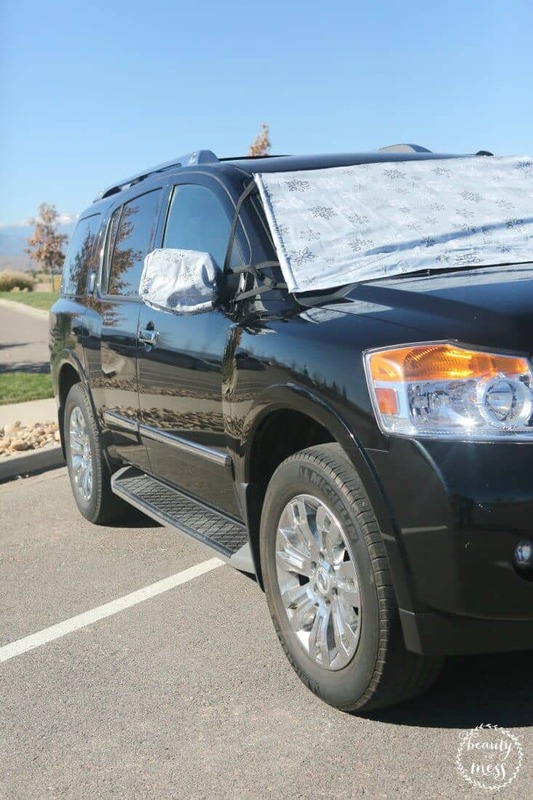 There are two sizes for whatever size your vehicle might be so that it can protect your primary viewing area, and includes a 9” wiper-flap. It also includes a driver’s side security panel so it’s there when you need it. There’s no reason for you not to have one. Unless you live in Florida, you need a FrostGuard. When my husband first saw it he thought it was genius! 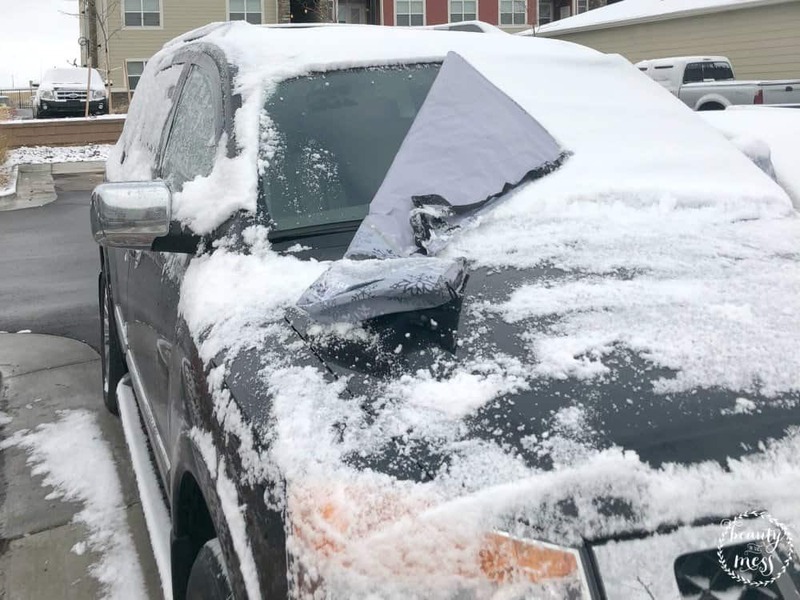 But then he started wondering what to do with it after it was covered with frost and snow because no one wants a soggy mess in their car. Thankfully the people at FrostGuard thought of that! It comes with a quick-dry storage pouch which means there will be no soggy backseat. Whereas I am super thankful that we have our FrostGuard and it will take less time to remove it than it will take my kids to get buckled into their seats, ready to get to school. It will make a huge difference in the morning! Our friends at FrostGuard are offering my readers a special discount so that you are prepared this winter. You can get 20% off the FrostGuard Signature Bundle with the code winter17 before December 31, 2017 (Some exclusions may apply). This is a sponsored post written by me on behalf of FrostGuard. Great tips for better mornings all year! I’ve never heard of a FrostGuard, but now I can’t see living without it!